I should have done this earlier. For all of my talk of personal finance and wealth accumulation, I sadly only have a vague idea of my net worth! Well, a quick Google search remedied that (see site here) and a few minutes later, I found out how much (or little:p) I am actually worth. 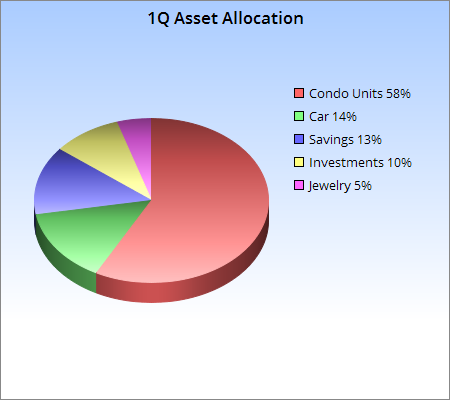 I tweaked the suggested method and categorized my assets into the following: condominium unit, car, savings/checking accounts, investments, insurance cash surrender value and jewelry. I gave approximate values to the condo unit, car and jewelry which I would like to believe are pretty accurate, give or take a few thousand pesos, while everything else are their actual values as of January 28, 2014. My only liability is the mortgage which still stands at around Php620,000.00. After deducting the liability from the assets, I’m happy to report that I have a positive net worth. Yay me! But more than knowing how much I really am worth in the literal sense of the word, calculating my net worth every few months or so will be a big help to see if I’m making progress in my goal towards financial independence. And since I finally mentioned financial independence, what do I really mean by it? No really, I still am not clear on what financial independence means to me. This is a topic for another blog post altogether. I’ll do another net worth check in June. I’m fairly sure that my net worth will still be positive, because we don’t plan on making any big purchases this year, but I’m curious to find out how my investments will fare by the middle of this year. The past year has not been kind to my portfolio at all and I just barely broke even a mere few days ago, then the market started to slow down again. Ugh. Hassle. Anyway, that’s how stocks roll. Can’t hate it when it’s just being true to itself. Ako din, I'm OC with incomes to calculating my net worth! Every 3 months! kayang kaya! Bored and with nothing to do but calculate everything. hahaha! It feels good seeing that all that scrimping is all worth it knowing that our net worth increases noh?! I'll have to see in a few months if my net worth will actually increase, considering that we have some condo renovation projects in the works and that will cost moolah! I think when you renovate your place and really takes care of it, you are increasing the worth of your property. So worth it ang gastus so ok lang yan. At least you've got to enjoy the after-renovation plus it increases the value of your property. I'm not sure if the renovations will really increase the value, because property values are usually guesstimates to begin with, but for sure, it will be more attractive so it might sell quicker when the time comes. For now though, I just want a nice mini kitchen and a bright and cheerful unit. And maybe my secret dream of having my space featured in Real Living magazine will finally come true. I compute my net worth once a year. As a government employee, I am required to submit my SALN. hehe. I think I should do it at least every quarter. I have a question. Did you include interests in the computation of the mortgage payable (P620,000)? Or did you treat it as interest expense? Sorry, I don't know what those are. I just relied on the amount indicated in the statement of account as my remaining balance. It’s like this. Let’s say the cost of my unit is P2M. So, I’ll treat it as an asset, right? If I mortgage it, of course, the bank will charge interest. Let’s say, my total payable is 3M (2M cost plus 1M interest). If I compute my net worth, should I treat 1M interest as liability? If I do that, my liability will be greater than my asset. As per google, interest expense is not a real account or balance sheet account. As I understand it, interest should not appear in the balance sheet or in the computation of net worth. I don’t know. I will ask an accountant. Hehe. Regarding the interest, I think the balance does not include the interest because for every 5k I pay every month, only 1k ++ is credited to the balance and the rest is treated as interest payment. That's why I make advance payments because anything on top of the amount due is credited to the outstanding balance which whittles down the balance and also reduces the interest payments I'll be making down the line. I'm not really sure if my response is responsive to your question, but unlike your example above, I don't think my total payable of Php630k includes the interest, so there's no issue or isolating the interest payment and then treating that as a liability. What I did, given my crude math abilities, was to estimate my unit's value added it to all the other assets and then subtracted the mortgage as liability from the total assets. 1. First, tama. Interest expense is not included as part of the value of the house. It is separately computed as a liability (we can include this as part of the mortgage loan). While there are loans nman na already "fixed" interest", it means na at signing of loan contract plng, your bank has already informed you how much is your total interest + principal. So pre-payment of your loans has no influence to reduce your outstanding balance. This usually the scenario sa bank. (I made a loan at a bank abroad and interest was fixed, so no bearing even if I pay the total balance of my loan at an earlier date). 3. To compute for the value of your property, we can choose from the selling price or zonal value (when you pay your property tax), whichever is higher. This is the “fair value” of the property. Thanks so much for clarifying things Lyn! And I would love to receive a copy of the excel file. Please email it to me at jillsabs@gmail.com. Thanks again! When it comes to convenience, I find that Pag-ibig is better than bank loans because there are less documentary requirements with the former. The possibility of getting your loan application granted is also higher with Pag-ibig, as long as you're a member in good standing and your monthly mortgage will not exceed 20% (or is that 30%?) of your monthly take-home pay. When it comes to interest rates, Pag-ibig has the lowest when the amount loaned is less than 800k, but above that, there are other banks with lower interest rates. But what I like best about Pag-ibig is that excess payments are credited to the outstanding balance, unlike with most bank loans where you'll even be penalized if you pay in excess of the monthly mortgage. That's why it's easy to pay down a Pag-ibig loan and in effect avoid interest payment by paying off the mortgage amount earlier than the contracted period.